This beautiful shabby chic teardrop swag will be the perfect addition to your shabby chic home. 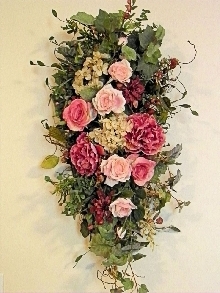 Lush soft green ivy, pink peonies, mauve and pink roses, cream hydrangea, and a touch of burgundy flowers and berries. A large 36" tall, 16" wide at widest points.